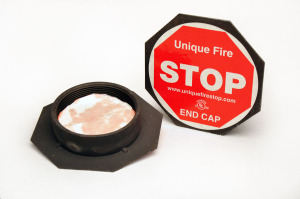 UNIQUE Threaded Endcaps are designed for sealing the ends of abandoned firestop sleeves that are threaded, including our Threaded Firestop Sleeve System. Sets of 2. UL Classified for up to 4 hours. Made in the USA. UNIQUE Threaded Endcaps are designed for sealing the ends of abandoned threaded sleeve systems in firewalls. Firestop sleeve systems in firewalls are not allowed by ANY jurisdiction to be left open or unattended overnight, on weekends or EVER. The National Electric Code requires that abandoned cables be removed from sleeves to reduce the fuel load in a fire. As abandoned cables are harvested, sleeves are left empty and must be firestopped and sealed. Our Threaded Endcaps are available in 3 sizes to fit our (IMC-rigid) 1”, 2”, and 4” diameter Threaded Firestop Sleeve Systems or any threaded sleeve made to IMC specs. Endcaps come in sets of two. The required intumescent putty is included with our Threaded Endcap Systems. This putty may be used to seal the empty sleeve now and reused later when and if new cables are installed. RIGID or IMC Endcaps are available in 1″, 2″, and 4″ inch sizes. They come in sets of two. Each Endcap includes UNIQUE intumescent putty for use when the sleeve is brought back into service. A (rigid – IMC) Threaded Sleeve with abandoned cables. Remove the cables and clean up the ends of the sleeve system. Leave the protective wax paper in the Endcap to keep the intumescent putty from contamination. Screw the Endcap on the end of the abandoned threaded sleeve until the Endcap seats by hand. Do not over tighten. Take a picture of your sealed system.